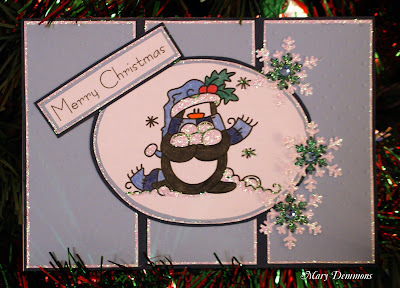 I made this card using Poppi Penguin Christmas Snowball from Bugaboo Stamps. The sketch I used is from this week's challenge at Meljens. I backed my card in Navy Blue cardstock. Each strip of pale blue cardstock is backed in white cardstock. I added crystal stickles to all the white cardstock, image and to the snowflakes. So pretty, those glittery snowflakes are so special, thanks for playing along with us at CCCB! cute, cute, cute! Thank you so much for playing along at CCCB! What a sweet Christmas card, loving the pengine image always seem such cheery characters. Thank you for joining in at Stamptacular Sunday challenge this week and good luck. This card is very pretty! Thanks for joining us at Digi Doodles Shop`s Best. Very nice Mary, love the LO too, thanks for joining us at Digi Doodle shops Best. Absolutely ADORABLE Mary!! Love the layout and the BLINGY snowflakes too! Thanks so much for playin' along with us this week for the Bugaboo Stamps Catch The Bug "Anything Goes" Challenge! Awww this is sooo sweet! I love all of the sparkle!! Thanks for playing in the Bugaboo Challenge this week! Darling image and those snowflakes are just gorgeous! Thanks so much for joining us this week at Digi Doodle Shop's Best! How fun is this? Love the Poppie Penguin. He is one of my faves. Thank You for playing along this week at Bugaboo. Perfect card! !Thanks for playing with us at SMC this week. Gorgeous take on the Meljen's Design sketch! I love the added sparkle of the snowflakes and snowballs!!! Adorable! Thanks for joining us this week! Awww, what a super cute little image. Thanks for joining us this week at Totally Papercrafts and SCSC. Good luck. Adorable! I love Poppi! Thanks for joining us this week at Christmas Card Challenges! Lovely card Mary, cute image. Thanks for sharing at our 100th Challenge at the Crafty Pad. i love this card :) so cute.. with all the glitter. Thank you for playing in the craft your passion ANYTHING GOES this week :) and I am a little late but i thank you also for playing with us on the MELJENS sketch challenge , Hope you will play again this week with us there. Good Luck! I love the sparkle of this card and your interpretation of the sketch. Thanks so much for playing along this week in our Sketch challenge at Meljen's Designs this week!